Last week I gave you some ideas for Vertical Gardening in Small Spaces, so it only seems natural to continue on with that same topic, by introducing you to some great accessories to help you create inviting tiny terraces or patios that you’ll want to spend time in. Now that Spring’s officially arrived and the weather’s finally beginning to warm up, I’m more than ready to get back outside and start enjoying my backyard patio space again. Since I live in a condo in Los Angeles, I don’t have a backyard, but I do have a small patio space that serves as my outdoor space. So I’m constantly on the search for great items to maximize this space and make it even more inviting to spend time in. So if your patio or terrace is in need of some sprucing up after too many months of winter neglect, check out these cool patio accessories that are made specifically for small spaces and will make you want to spend more time on your patio or terrace with friends and family. 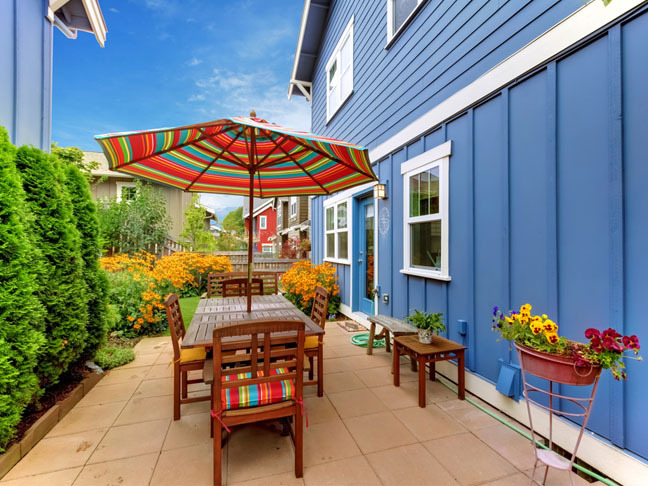 It can be challenging to find small patio sets that are the right scale for small spaces, since so much of what’s available in outdoor furniture tends to be of the larger scale variety. 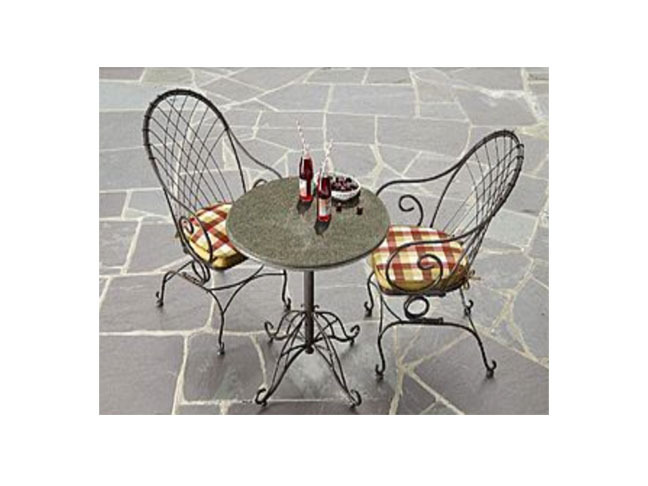 So when I came across this 3 piece Cherry Valley Bistro Set, it was not only visually appealing, but was also super well priced and just perfect for seating two people for your morning coffee or to grab a bite to eat in the afternoon for lunch. Or if you have a long narrow patio or terrace space, these sets are so well priced, you could even buy two of them to create more than one seating area within your space. Plus having two small sets leaves you with lots of options for moving chairs and tables around and changing up your seating areas on an as needed basis. These lightweight and space saving Telescoping Infrared Floor Heaters are such an improvement over the patio heaters of years past that required awkwardly heavy propane tanks that always seemed to be empty at the time when you needed them the most. 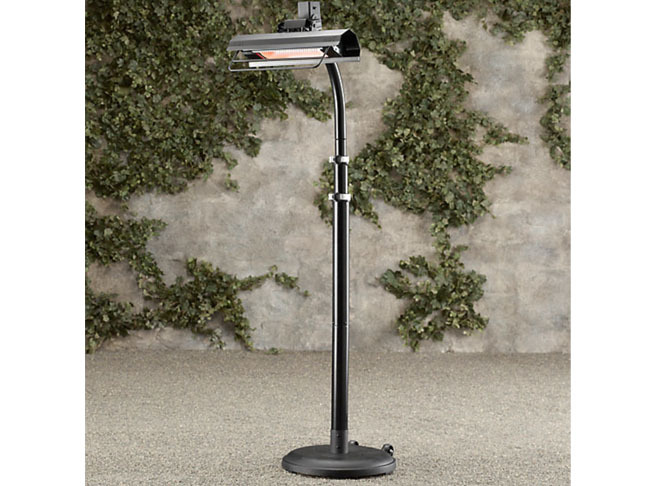 And you can adjust the 1500 watt quartz halogen lamp heating element on these heaters from 52″ to 93″ in height, so you can direct the heat exactly where you need it the most, while also keeping the heating element safely out of the way. They’re super quiet and easy to operate because they plug into a standard 110-volt household current and they’re available in either stainless steel or black finishes. 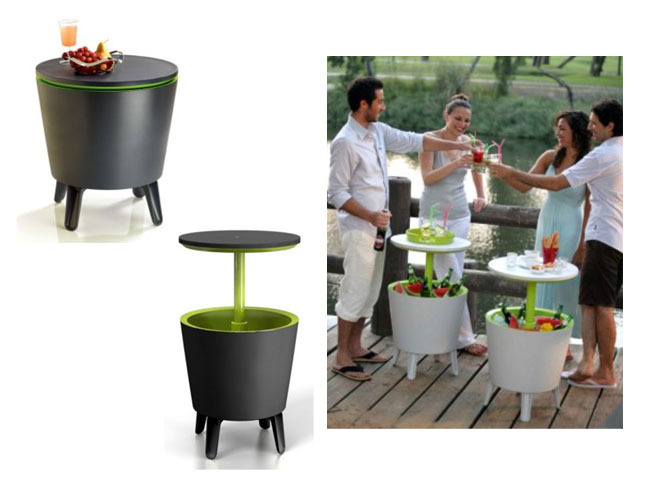 Small side tables are always indispensable items for small patios or terraces, and this Cool Resin Bar Table is not only well-priced, but it also converts to being a very user friendly ice bucket for storing cold drinks & snacks too. And it’s available in a variety of cool color combinations, so you’re sure to be able to find one that will fit in perfectly to your intimate terrace space.